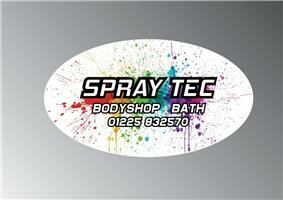 Spray Tec Bath Ltd - Garage/Vehicle Services based in Bath, Somerset. Spraytec Bath Ltd is a technically advanced Accident Repair Centre based in Bath, Somerset. We have a highly trained team of staff with over 60 years combined experience in the vehicle repair industry, using state of the art equipment we carry out all aspects of vehicle bodywork repairs, ranging from minor dents and scratches to major insurance repairs. All repairs performed and Spraytec Bath Ltd are put through a rigorous final check and given a complimentary wash, wax and Valet to ensure every vehicle is returned to the owner looking its absolute best no matter how big or small the job may be. We also offer a complimentary claims handling service which removes all of the hassle from a potentially troublesome insurance repair. This includes all necessary correspondence direct with either your own or the third party insurers and a complimentary courtesy vehicle for the duration of the repairs. From the moment your vehicle is left with us at our workshop you can be confident in the fact you are receiving only the highest quality of service. For a free written estimate and piece of mind contact Spraytec Bath today.